LUPEC Boston has been busy this summer traveling the country and doing important cocktail research for the benefit of our loyal readers. Sure, you could have found several members at Tales of the Cocktail in New Orleans but we also took on a bigger challenge: where to get a decent mixed drink in Alaska? It wasn’t easy. Anchorage is a beer town. You can’t trip over a curb without finding great local beer. With three Anchorage-based breweries/brew pubs and great halibut, salmon, and other seafood in every hole in the wall pub – you could be content for some time. Undeterred, we found a hidden gem at the Double Musky Inn as featured in this week’s Dig. Sitting at the bar was a pleasure – our wishes almost magically fulfilled by our “bartendress” Suzette and a busy but attentive crew. Sipping on the Deanna’s Garden, named for the proprietor’s wife, had us dreaming of other ways to play with herbal teas in simple syrups. You can order the Spring Garden herbal tea at Summit Spice & Tea Company or find a similar blend locally. Steve mixed a fine Maker’s Mark Manhattan on the rocks. And I’m not sure how or where they find the cows, but they have the finest steaks we’ve eaten anywhere (without the pretense, mini-skirted escorts, and power egos that come with our so-called steakhouses). A week later we joined the regulars at the bar again, and Steve was already reaching for the Maker’s before we sat down. If you find yourself in Anchorage, don’t miss it. The low key “old-school” experience is one that is hard to find in Boston these days – classic bar, classic menu, classy service. Build in a rocks glass filled with ice. Stir. Sounds counterintuitive that the ladies of LUPEC Boston had to go to New Orleans to meet some amazing regional people, huh? That’s Tales of the Cocktail for you, connecting like-minded drinkers the world over. 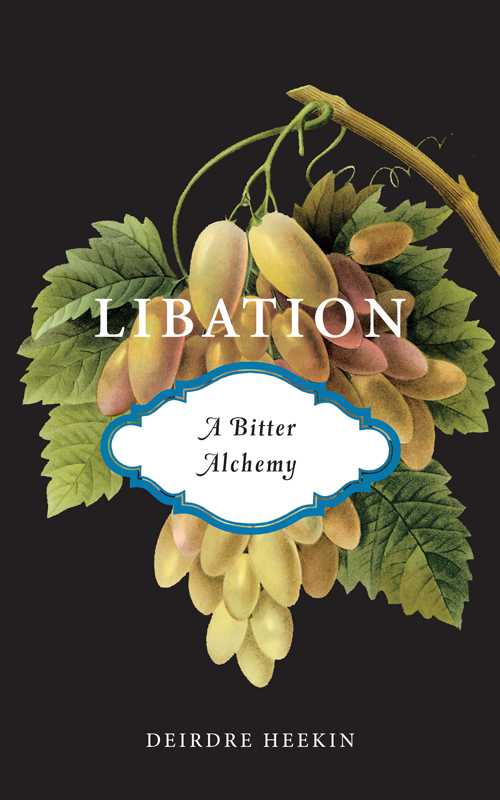 One of our new favorite near locals is Deirdre Heekin, author of a new memoir of her drinking life, Libation: A Bitter Alchemy. Deirdre co-owns Pane e Salute, an acclaimed osteria in Woodstock, VT, where she curates an eclectic niche wine list. A lover of Pimm’s who dabbles in wine-making, she is a woman after LUPEC Boston’s heart. We plan to read and report about her new book…as soon as our hangover subsides. Talking Taste series in Boston tomorrow, Friday, July 24th @ 6:30 p.m. The talk is free with the price of admission to the museum – a perfect Friday night outing before or after stopping by Drink for a drink. In Parts I and II, we discussed how to make your own fresh syrups to substitute those artificially flavored and colored store brands products like grenadine, and/or to create a syrup flavor that isn’t commercially available. Today we’ll be discussing how to make some simple and delicious sweetened preserved cherries for garnishing cocktails, in place of those artificial, borderline florescent cherries we know of today as the “maraschino” cherry. Maraschino cherries were originally named as such because their earliest recipes included the use of the marasca cherry, preserved in a liqueur made from this cherry, called Maraschino liqueur. Over the years, Americans began experimenting with different types of cherries as well as with different flavors, leading eventually to the substitution of the marasca cherry with the Queen Anne cherry, (among others) and the addition of flavors like natural almond extract. Because of a 1912 USDA regulation stating that the maraschino cherry is defined as “marasca cherries preserved in maraschino liqueur” under the Food and Drugs act of 1906, these new adapted cherry recipes had to be labeled as “imitation maraschino cherries”. Over time these cherries continued to suffer further insult when Maraschino liqueur was substituted with, and then replaced altogether by, a non-alcoholic brine solution for use as a preservative. There is much dispute whether this brine substitution occurred before or during Prohibition in the United States, but regardless, the end result is the same; what was at one time a natural liquor preserved and deliciously flavored delicacy, became a bleached, brined and artificially colored excuse for a piece of fruit. Back to basics, I say! There are many different ways to go about making sweetened preserved cherries, with the most popular being the Brandied Cherry. The following recipe is an adaptation from several different recipes I’ve researched. Wash, de-stem and pit cherries. In a large saucepan heat water, sugar, and lemon juice, stirring frequently, until boiling. Add cherries and brandy and reduce heat. Simmer for 10-15 minutes. Let cool and place in an airtight glass jar. Refrigerate for up to 2 weeks. Other ways to preserve cherries can be even simpler! I’ve preserved cherries in Yellow Chartreuse, and even in St Germain, by simply pitting the cherries and pouring the straight booze over top, making sure the cherries are completely submerged. These cherries need to soak for a minimum of 1-2 weeks, but can last up to several months, as long as the cherries stay beneath the surface of the booze. Try using your favorite liqueur, but keep in mind, liqueurs on the sweeter side, (as long as the alcohol content is at least 25%) tend to work best.